Four season flights: There’s good news for North American travellers: Getting to Greece from the USA both during and outside the peak season summer months will soon be a lot easier. Emirates airline today announced a new route that will provide daily non-stop service between Athens International Airport and Newark Liberty International Airport — year-round. It will be the first time since 2012 that an airline will offer daily non-stops from the USA to Greece all year long. The non-stop transatlantic service is part of a new Dubai – Athens – Newark route that will launch on March 12 2017. Emirates will fly a Boeing-777-300ER-2 on the route, providing 8 seats in first class, 42 in business class, and 304 in economy. “Emirates flight EK209 will depart Dubai at 10:50 local time, arriving in Athens at 14:25 before departing again at 16:40 and arriving into Newark at 22:00 on the same day. The return flight EK210 will depart Newark at 23:45 local time, arriving in Athens the next day at 15:05. 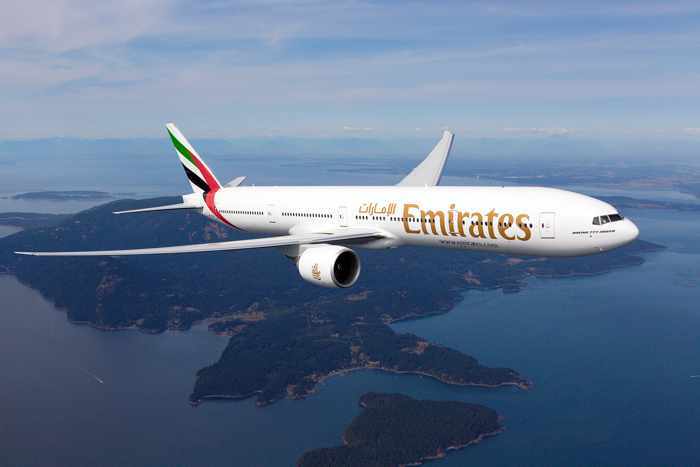 EK210 will depart once again from Athens at 17:10 bound for Dubai where it will arrive at 23:50, facilitating convenient onward connections to over 50 Emirates destinations in India, the Far East and Australia,” the airline said in its media release. “Passengers in all cabin classes can enjoy the friendly service from Emirates’ international cabin crew, meals prepared by gourmet chefs, and over 2,500 channels of the latest movies, TV shows, and music hits on its award-winning ice inflight entertainment system,” the announcement added. While the new Emirates route will greatly facilitate travel to Greece for Americans, it also will benefit travellers in Toronto and other parts of eastern Canada by providing a possibly more convenient alternative to flying to a major European city and then catching a flight to Athens. I’ve been considering off-season trips to Greece, so the forthcoming Emirates service is welcome news to me personally, as I’m sure it will be for the large Greek communities in Toronto, Montreal and the New York City area. 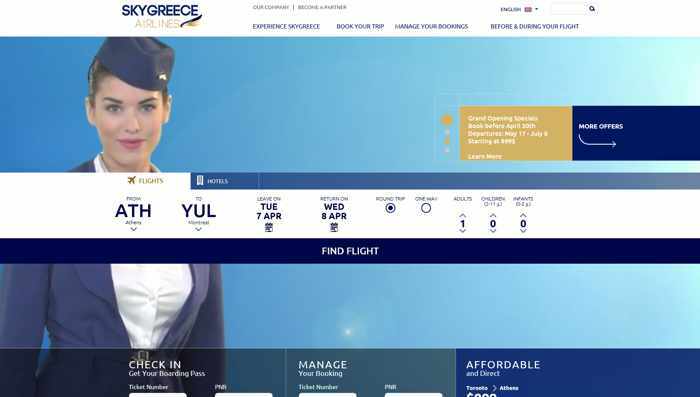 Travellers curious to check SkyGreece Airlines fares and schedules, or book seats, can do so online now that SkyGreece has launched a new website. The airline announced on Facebook today that its new site — featuring fast and easy online booking — has gone live. The new site makes it a breeze to check prices and routes for the airline’s service between Athens, Toronto and Montreal, and between Thessaloniki and Toronto. Since March 21, when SkyGreece first announced that flights were available for booking, customers had to phone an airline reservation representative or contact a travel agent to obtain further information. Out of curiosity, I checked fares and availability for the dates I am already booked to travel to and from Greece next month, and discovered I would have saved about $100 flying economy class on SkyGreece. The airline offers three fare categories: economy, “economy flex” and premium. 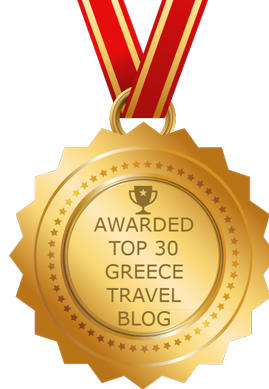 I have reported extensively on SkyGreece Airlines … click here to see my previous posts. Fare deals: SkyGreece Airlines has finally released introductory fares for its new Toronto to Athens, Toronto to Thessaloniki and Montreal to Athens routes, which launch on May 17, 20 and 23, respectively. 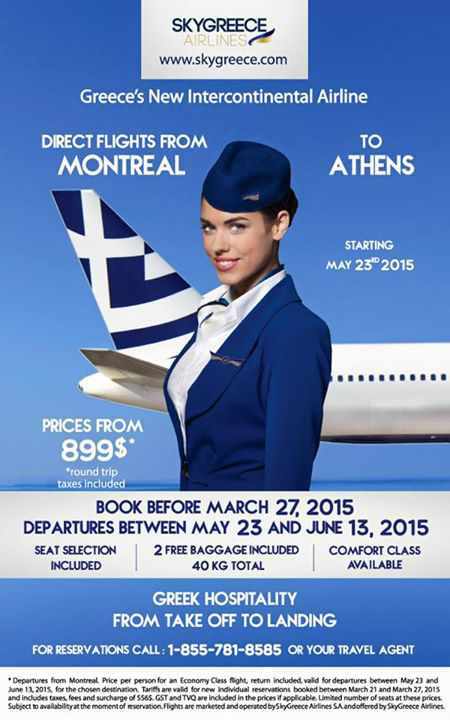 In a post on the SkyGreece Facebook page March 21, the airline announced that economy class fares for a limited number of round-trip flights between Montreal and Athens will start at $899 (taxes included) for departures between May 23 and June 13. The price includes advance seat selection and two pieces of luggage weighing up to 40 kg. Presumably, the price is in Canadian dollars. Fares must be booked before March 27 either through travel agents or by calling SkyGreece’s North American reservations desk at 1-855-781-8585. A “comfort class” option is available; however, the Facebook page announcement does not indicate what those particular seats cost. The $899 fare breaks down to $334 for the flight and $565 for applicable taxes, fees and surcharges. In a Facebook post on March 25, SkyGreece announced that prices for its direct flights from Toronto to Athens and Toronto to Thessaloniki will start at $899 (taxes included) for departures between May 17 and June 14. These seats must be booked by April 4, and include the same advance seat selection and luggage allowances as on the Montreal to Athens flights. As I reported in a January 29 post, the airline said it will offer three flights per week between Toronto and Athens, commencing May 17. A once-weekly flight from Toronto to Thessaloniki will start on May 20, and the Montreal to Athens route will begin operations on May 23. The new airline will offer Canadian travellers an alternative to Air Transat and Air Canada rouge, which until now have been the only airlines with direct flights between Canada and Greece. The Transat and rouge flights are only seasonal, however, whereas SkyGreece is proposing to fly year-round. Earlier this month, the Internet has been abuzz with word that return SkyGreece flights could be booked online for as low as US $415, including all taxes and fees. (That would be CDN $521 under current exchange rates.) Several people contacted me to say they had seen these prices on Google Flights Explore; however, when I checked, I couldn’t find any SkyGreece flights listed at all. Another person later told me he had seen a July return fare of CDN $561 for a July 5 flight. The $899 special fare is a good deal — but I’m glad I didn’t delay booking my next trip to Greece to see if I could save money once SkyGreece released its prices. I found an even cheaper fare on Air Transat in early January and will be flying to Athens on that airline for the 11th time this spring. Still, I’m sure the seats available at that price will be snapped up quickly. It will be interesting to see how SkyGreece’s regular fares will compare to those offered by its competition. The new routes could be appealing not just to Canadian travellers, but also to Americans living in border states a reasonable driving distance from Montreal and Toronto. With the US greenback so strong against the Canadian dollar at the moment — US $1 = CDN $1.26 at today’s exchange rates — more Americans are bound to consider flying to Greece from Canada this year. SkyGreece Airlines posted this photo of its Boeing 767-300ER aircraft to its Facebook page today. Routes revealed: Travellers will have more choices for direct flights between Canada and Greece beginning Sunday May 17. That’s the day SkyGreece Airlines is expected to launch service between Athens and Toronto, with three flights per week. On Wednesday May 20, SkyGreece will start a once-weekly flight to Toronto from Thessaloniki, and on Saturday May 23 it will debut a once-weekly departure from Athens to Montreal. Canadian charter airline Air Transat and Air Canada rouge, a “leisure” division of Air Canada, are the only carriers presently offering direct flights between the two countries — and only during the spring to fall travel period. 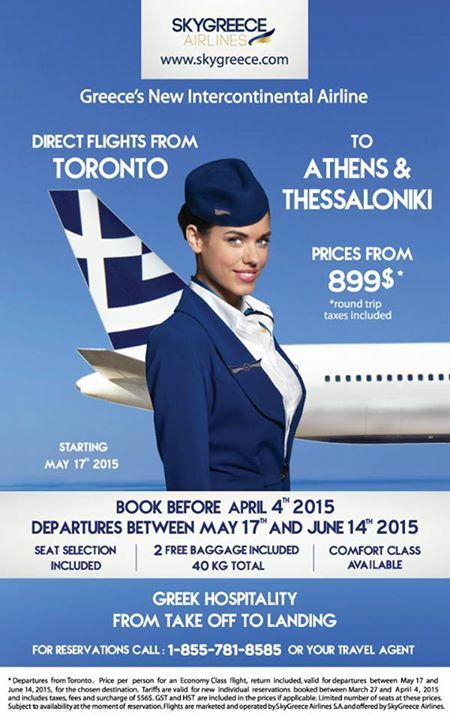 SkyGreece will become the first carrier to offer scheduled commercial service between Thessaloniki and Canada. The two Canadian airlines fly to and from Athens only. The SkyGreece transatlantic schedule was revealed January 30 on the Greek Air News Facebook page. The Greek Air News report did not include any information about fares for the flights between Canada and Greece. Curiously, SkyGreece didn’t make any announcement about its new routes on either its website or its Facebook page on January 30. It did, however, post two photos of its single Boeing 767 aircraft on Facebook (including the one I have republished at the top of this post) along with the comment “The family will be growing soon! !”, which suggests SkyGreece may soon be adding more aircraft to its fleet. But on January 31, SkyGreece did post news of its routes (indicating slightly different service starting dates than Greek Air News had mentioned.) “We have listened to the continuous demand of the Greek community in Canada and in Greece and decided to develop our flight schedule to meet the demand.,” the airline stated on its Facebook page. As I reported in a January 21 post, SkyGreece received Canadian regulatory approval this month to commence scheduled service between the European Community and Canada. In an announcement about the Canadian Transportation Agency decision, SkyGreece promised to unveil its “new and exciting flight program” within days. A private company based in Athens, SkyGreece has offices in Montreal, Toronto and New York. On January 26 the airline announced the appointment of Denis Codere as its deputy chief commercial officer, and on January 28 it announced the appointments of Eleni Kessaris and Louise Cofsky to director positions on its Canadian management team.